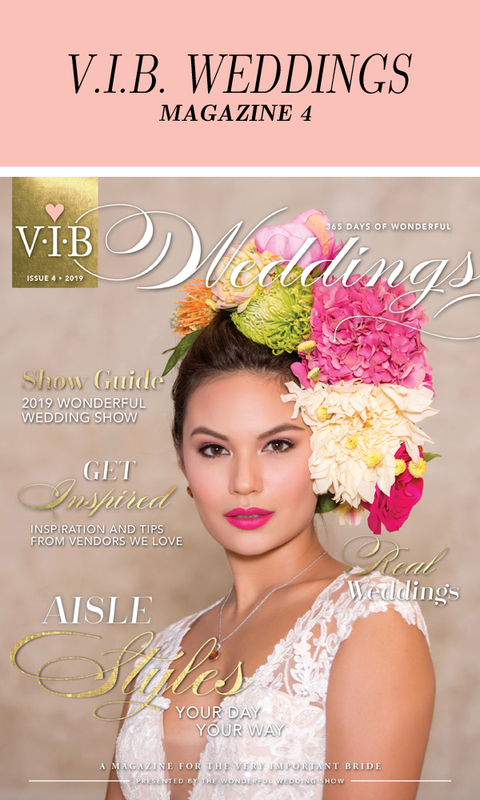 Look for the Official Show Guide for the Wonderful Wedding Show in V.I.B. Weddings Magazine which is distributed FREE to everyone at the show. The V.I.B Weddings Magazine and Show Guide contains the floor plan and exhibitor listings so you can plan whom you need to see at the show. The exhibitors are listed alphabetically and by booth number so you will know exactly where to find them. There are over 300 exhibitors so the floor plan & listing will be very helpful! It is highly recommended that before the show, you should print labels with your full name, address, postal code, email address, phone number, and wedding date. Having these labels will save valuable time when entering the numerous prize draws & contests at the show. When entering draws, instead of having to repeatedly write all your information down, simply peel off one of your personal address labels and place on the ballot form! In addition to your smartphone, it is also a good idea to bring along a pen and paper so you can make notes about the various exhibitors as needed. After visiting hundreds of displays, it’s easy to forget which ones you were interested in! The show has over 130,000 square feet of displays, so be sure to dress comfortably and wear comfortable shoes. Also keep in mind that you may be actually trying on gowns at the show so wear sensible undergarments and clothing that will be easy to change in and out of. There will be a coat check available for your convenience at the show, but leave any valuables at home as items placed in the coat check will be left at your own risk. The best thing about the Wonderful Wedding Show is that you can bring your entire wedding party all at once if you want! Or try planning on bringing your bridal party and mothers one day, and your intended on the next day. Although thousands of visitors attend the show each day, the busiest day is usually Saturday, so if you want to try to avoid the crowds, Sunday afternoon might be a good time to attend. Please visit our Time/Location page for full information about our Show Hours. Get directions to the show by visiting the RBC Convention Centre Winnipeg website. The RBC Convention Centre Winnipeg has 2 parking garages within the facility. There is also alternate parking available within walking distance of the facility in case both the garages are full. Find parking information by visiting the RBC Convention Centre Winnipeg website. Be sure to pre-register here on the show website to win great prizes! When you pre-register on the show website you will also get “VIB” (Very Important Bride) early entrance at 10am into the show! (regular show start is 11am) When you arrive at the show, proceed to the V.I.B. Registration Area, located at the top of the 3rd floor escalators in the new south building. When you arrive at the Registration Desk simply provide your name to receive your free Bride Gift Bag and VIB Lanyard, & get fast-tracked into the show. If you arrive early you will find you can avoid the crowds if you start at the back (north side) of the hall, instead of the front where everyone usually starts, and then work your way up to the front (south side). Also be sure to make notes after visiting with exhibitors so you will remember which exhibitors you are interested in. Many exhibitors will be offering specials that will only be available at the Wonderful Wedding Show. You can take advantage of these specials after you have done your comparison shopping. Comparison shopping is easy at the show because instead of running all over the city, everything is all under one roof! There will be daily fashion shows during the show. Admission to the fashion show is included in the ticket price to the Wonderful Wedding Show. Each fashion show is approximately 30 minutes long. Please visit our Show Dates & Times page for full information about our Fashion Show Hours. The Fashion Show has a seating capacity of approximately 1,000 so be sure to arrive early to ensure you get a prime seat. There will also be a fashion show program waiting for you on your seat to help you follow along with the show. The program also lists all the fashion show participants and their locations to purchase the fashions you have seen. Please note that cameras, video recorders, and other recording devices are not permitted during the fashion show. Be sure to hang onto the V.I.B. Weddings Magazine and Show Guide after the show is over as you will find it makes a great reference guide. Many brides find it difficult to remember the numerous exhibitors and information from the show, so the Show Guide will be a valuable tool. Many of the brides take the information they receive at the show & organize it into a 3-ring binder. Simply sort out the information you’ve collected in your shopping bag into service categories and place in the binder in order of priority. Presto! 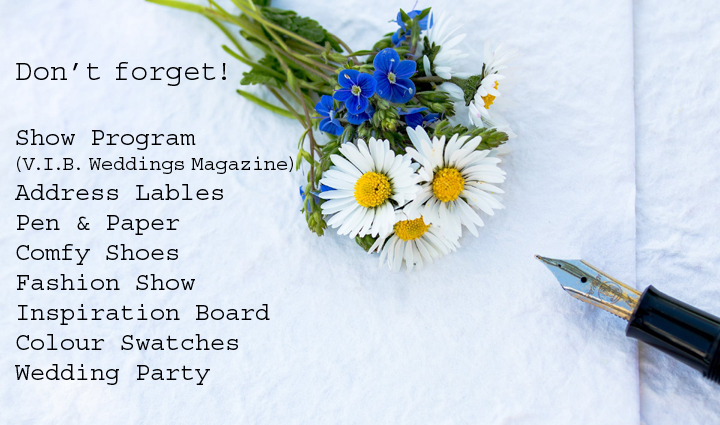 An instant wedding planner! Now that you’re organized, you can get ready to enjoy your wedding planning experience, knowing the Wonderful Wedding Show has helped you to find all the information you will ever need to know about planning your wonderful wedding!